He is known for chasing and playing with an alligator. Although the exact date of Gator’s birth is not known, it is believed he was among a group of unidentifiable yearling manatees seen at Blue Spring State Park, located in Orange City, Florida, during the 2010-2011 winter season. Blue Spring is a vital warm-water refuge for manatees in the winter, and Gator returned to the park the following winter on November 30, 2011. As the years have passed, Gator has continued to visit Blue Spring – often arriving early and leaving late for the season, which usually runs from November through March. His playful behavior is frequently noted, both by researchers and as seen on webcams located at the park. Gator has quickly become a familiar manatee to the Blue Spring park staff, and he tends to wander and play all over the spring run. Gator has a very identifiable scar pattern, making him easy to spot. Above, he examines a turtle in the Blue Spring run. 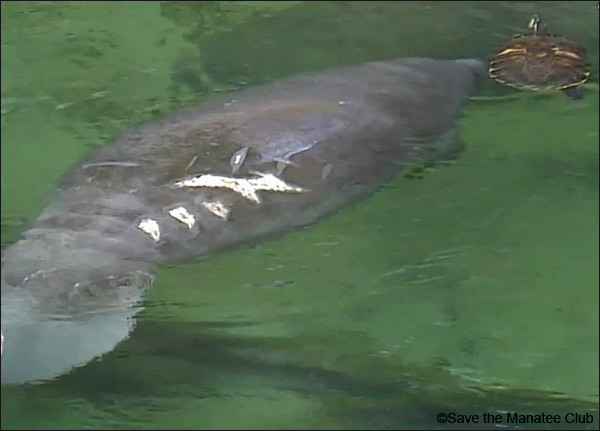 Manatee researchers use scars to identify manatees, and Gator has a very identifiable scar pattern, making him easy to spot. He has suffered a boat hit and has six large propeller cuts down his right rear side. Sadly, Gator was hit by a boat again at the end of January 2012, and his new scar consisted of three propeller cuts and a large skeg cut, almost in the exact same location as the previous scar. Wayne Hartley, Save the Manatee Club’s Manatee Specialist who tracks the manatees at Blue Spring, also describes Gator as “a bit of a runt” as Gator is small in size. Gator arrived on November 1st last year for the manatee season at Blue Spring, and he made many visits to the park. 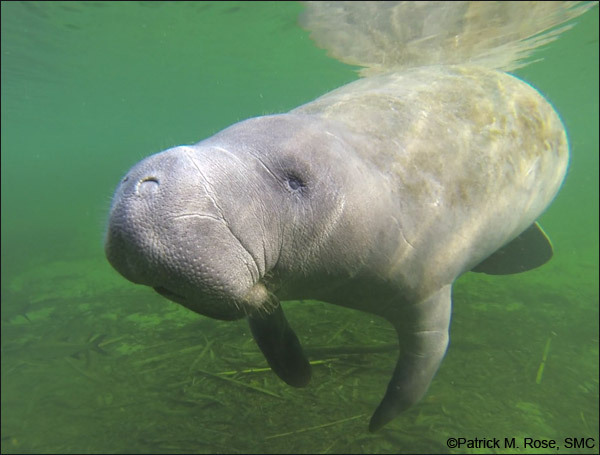 Wayne Hartley noted that he was all over the run “engaging in play with everyone, whether they wanted to play or not.” In late January and early February, the BBC was at Blue Spring State Park filming a documentary on alligators and manatees. Gator lived up to his name and may have made it into the documentary when he swam in front of an alligator the BBC was filming.